I tried something new this week. Upon returning from Podcast Movement 17, I was filled with excitement about podcasting and decided to do a show on the recent events in Charlottesville, VA. It's rare that a current event raises questions and discussion about history the way the protests and violence of Aug 13 have done. While I abhor the violence and horrific rhetoric that was being spewed by the protestors, the questions they ask are fascinating to look at. Is the Confederate flag evil? 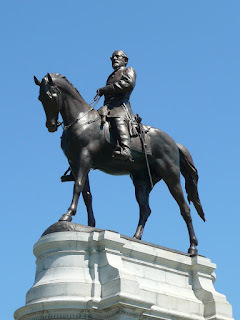 Are statues of historic figures like Robert E Lee racist? Like nearly everything else in history, the answer is complicated. And it revolves around a central question: was the Civil War about slavery? If the Civil War was about slavery, does that mean the monuments and flags honoring the south and its heroes espousing the racist ideology that drove the Confederacy to secede from the Union? What about the slave states that didn't secede? Did the northerners think they were fighting to abolish slavery? Ultimately, how should we remember the Civil War and the South's role in that conflict? We look at those subjects this week in a special, unscripted episode, all while trying to avoid modern-day politics like the plague. What are your thoughts on Confederate monuments and the Confederate flag? Do you think the Civil War was about slavery? Agree or disagree, I'd love to hear your thoughts. Share them in the comments below, on Facebook, or send me an email. Thanks for listening!